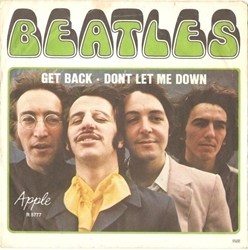 The Number Ones: The Beatles' “Get Back” (Feat. Billy Preston) . Beatles Radio: The Beatles, Solos, Covers, Birthdays, News The Fab 4 and More! They hated each other. The version of the Beatles who got together to record the Let It Be album in 1969 was, from a chemistry standpoint, the very worst version of the Beatles. Ringo Starr had already quit the band for two weeks, and his bandmates had to track him down and convince him to return. During the sessions, George Harrison quit, too. He stormed out for five days and, when he came back, he demanded that the band abandon the album’s whole central idea. The idea belonged to Paul McCartney. The Beatles had quit touring a few years earlier, and McCartney, fully understanding that the band was breaking apart, wanted to try out a back-to-the-roots move. It was an ambitious idea: He wanted the band to write a bunch of songs, rehearse them, and then play them live in front of an audience for the first time. They would release a whole album of new songs, recorded live, and they’d put the performance on film, too, so they could make a movie or a TV special out of it.